I have a lot of trouble keeping myself organized these days now that my toddler is hitting her full stride. We have been cooped up in this house together for several weeks between the bitter cold, snow and now the inevitable winter sickness. The knowledge that Spring is literally just around the corner (33 days from today) keeps me sane. It’s the goal-line I am pressing toward. I spend a lot of my free time each day working on my plans for this year’s garden. I like to have all my ducks in a row before I start. Today I want to pass on some very helpful software that I was introduced to this winter by a friend on a gardening forum I frequent. It is called SeedsNTrades and it is a wonderfully simple program that will help you get your seed stash organized. It is geared mainly toward tomatoes, but you can use it for all of your seeds. It will help you keep inventory on what you have, what you intend to plant, what you are trading off/receiving, detailed information for each variety and more. I have three 1-gallon Ziploc bags full of seeds, so I have really gotten a lot of benefit out of SeedsNTrades. Here are a few screen shots to show you what it does. 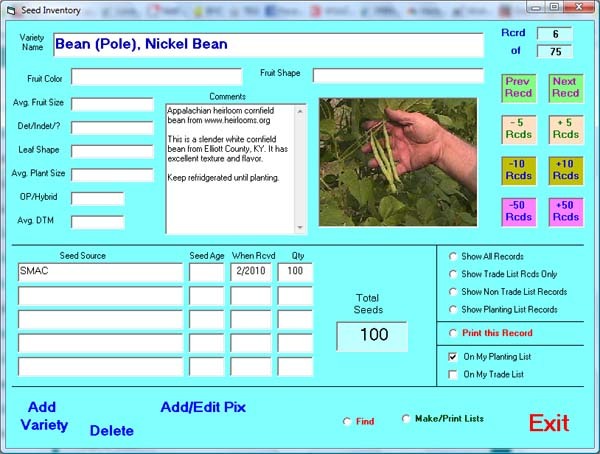 This is your main screen when you start the program where you select to enter either the trade info database or the seed inventory database. 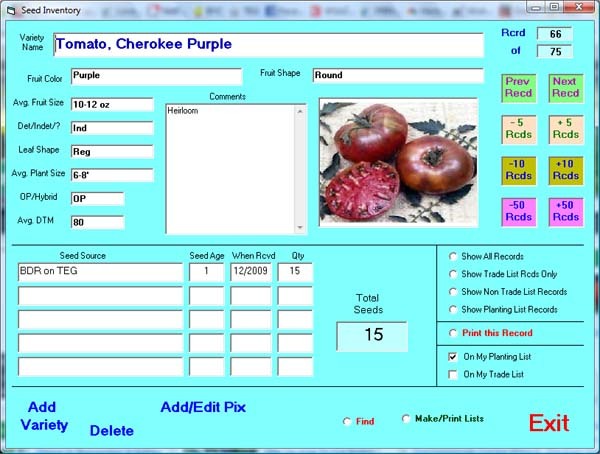 The following is a screen shot of the details I entered for my Cherokee Purple tomato seeds. As you can see, it stores quite a bit of information about the plant and you can even insert a picture if you like. You can enter multiple seeds sources with the specific seed age and quantity for each. Be sure to check the box if it is for planting or trade. This will be necessary when you go to create and print lists later. I like that I can quickly pull a trade list without having to dig through my bags of seed to see how much I have of what. The planting list is nice to have for various reasons. I can see what I have and what I still need to buy. I can see if I have several varieties of a bean, pepper or tomato and plan ahead for where I want to place them in my garden plan, especially for things that need spaced out to prevent cross-pollination should I intend to save seed from them to trade later. Although the fields are geared more toward tomatoes, you can also enter all of your other types of seeds. The database will store them in alphabetical order, so it is best to begin the listing with the plant type (ie. Bean), then follow it with the variety (ie. Bean, Kentucky Wonder). This way, when you go to print your lists, all of your Beans will be listed together. Tomatoes, Peppers, Lettuce, Squash, Cosmos, Marigolds, so on and so forth. Lists can either be sent directly to your printer or to a text file which you will find located under the SeedsNTrades program folder on your computer. 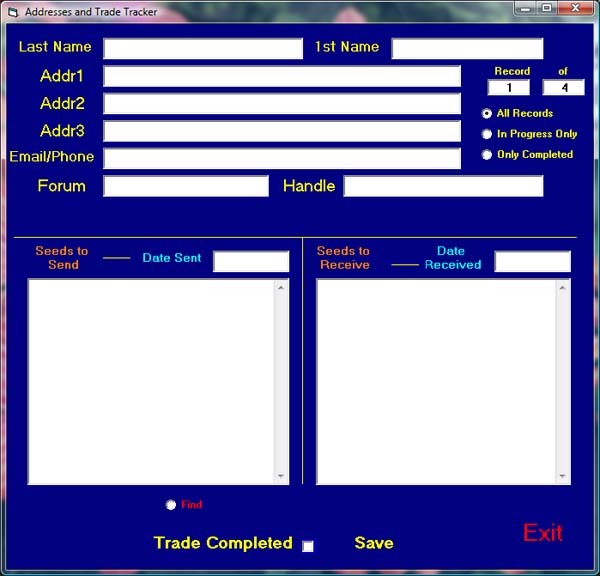 Here is a screenshot of the trade tracker entry screen. Here you can store contact information and list what you are sending and receiving and whether or not it has been sent or arrived. I’ve just started using the trade side of things. It will be very helpful if you make a lot of trades (perhaps on different forums) and will help you keep straight what you have committed to send out or what you are still waiting to receive in the mail. 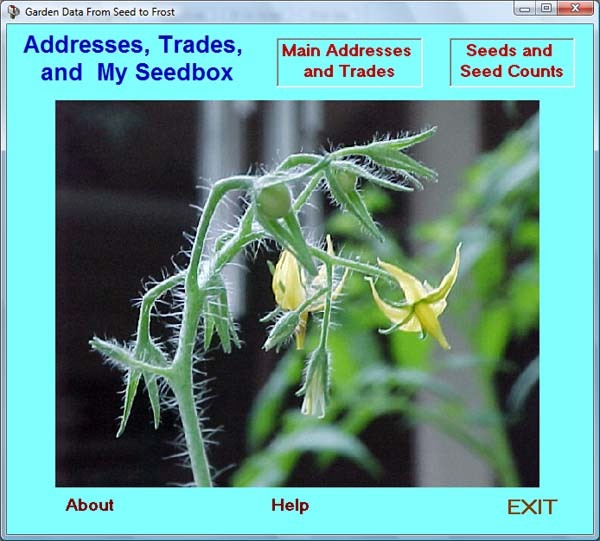 SeedsNTrades free software is available, along with three other similar programs by the same author, via a tomato lover’s forum called Tomatoville. If you join the forum, you can download it there. Or you can download it from me here. It is a small file, only about 6 MB. You will need to save it to your Downloads folder and extract it to your Programs folder using a Zip utility. I use jZip, which is completely free with no hassle. It is very important that you open and read the Readme file (located in the SeedsNTrades folder once you’ve extracted the program). Instructions on how to use the software are there. If you just jump in and start playing with it, you are likely to have a few error messages and possibly crash the program. The Readme file will show you how to use the program properly and explain all that it can do, more so than I have explained here. SeedsNTrades Software is Copyright (C) 2009 — by Ted Maiden. All Rights Reserved. It is written in Visual Basic Version 5.0 and is 100% new code. The databases are in Access Version 2.0. Some reports are in Crystal Reports Version 4.6.1. This program is uncrippled Shareware and can be distributed freely as long as it is unmodified. It cannot be sold for profit by anyone for any reason. For questions about its operation, the availability of its source code, or other inquiries, send an email to tedmaiden@aol.com. If you like the software, be sure to email the author and let him know you appreciate his work. If you have any trouble downloading or installing it from me here, just drop me a comment and I will try to help you out. I hope you find SeedsNTrades as valuable a planning and organization tool as I do.